As we’re now settled into a new year, it’s great to note that the fun Saturday action has already started on football the all-weather pitch. Cubs and Kittens (born 2011, 2012, 2013 and 2014) are up and running since last weekend as they enjoy their Saturday morning sessions that begin at 9.30am and continue until 10.30am. The Cougars have started in Loughlinstown Leisure Centre but will return to the all-weather between 12.00noon and 1.00pm on Saturday, February 17. This year, the Pumas have started on the all-weather pitch, also between 12.00noon and 1.00pm, with Jim Allen assisting Declan Service in helping the lads with their game. All the above groups would be only too delighted to welcome new members. So do come down at the nominated times to get involved and hone your football skills! If you like, call the clubhouse numbers above during office hours (on the right) to find out a little more. Please note that the office will not be open this weekend but will resume weekend opening on February 10 for your membership queries, payments and kit purchases. We’ll also see the resumption of DDSL 11-a-side games next weekend, so do expect to see the park coming alive as spring, hopefully, comes to Kilbogget! Looking forward to seeing everyone once more tomorrow morning! I’m just inquiring about my son joining the club. He’s 9 at the moment and will be 10 on the 31/7. It would be best to call the office on 01-235 4343 during opening hours (see right-hand side above). 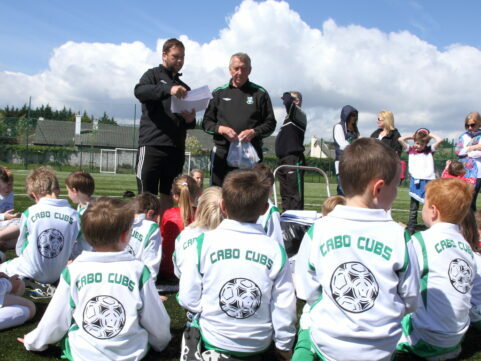 The staff there will know about the current disposition of players and teams at each age group. Let’s hope that your son finds a place on a team.